Both changes are improvements that EDF and local allies have advocated for and the Mead Administration deserves praise for leadership in this area. 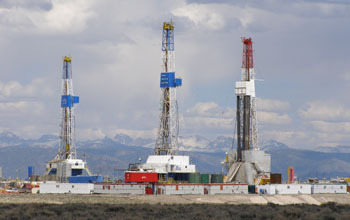 Once finalized and implemented, this rule will form the backbone of the state’s plan to clean up the air in and around Pinedale, Wyoming, that has become dangerously polluted by harmful emissions from the oil and gas industry. Expanding beyond leak inspections by making all pollution reduction requirements the state has proposed for wells sites apply to compressor stations as well. By also addressing things like pneumatic controllers, pumps, and dehydration units at the compressor stations, further pollution reductions can be had at a very cost effective price. As currently drafted, the state’s rules would still only apply strong, regular leak inspections to a small percentage of the sources in the basin. This is because many of the wells in the Upper Green River Basin will fall below the emissions threshold the state has proposed. A lower, more inclusive, threshold will capture more sources and reduce more pollution, since regular leak inspections are one of the best ways to reduce harmful ozone pollution in our air. Fixing this problem in Pinedale and putting forth the strongest rule possible will again demonstrate Wyoming’s history of leadership on air quality issues. And EDF will remain engaged as the rule goes before the state’s Air Quality Advisory Board in December. After all, doubles are great, but a home run here could clear the bases, and the air.